Recently completed and situated on just under a half acre of land, this brick and stone mansion in McLean, VA effortlessly fuses Colonial charm with modern craftsmanship. It features approximately 9,493 square feet of living space with six bedrooms, six full and three half bathrooms, foyer with stair hall and U-shaped floating staircase, elevator, formal living and dining rooms, butler's pantry, spacious gourmet kitchen with stainless steel appliances, breakfast area, family room with fireplace, lower level recreation room with wet bar, home theater, a three-car garage, and much more. Outdoor features include a front covered porch and expansive rear flagstone patio. Recently featured in The Robb Report, this contemporary-inspired brick mansion in St. Louis, MO was built in 2012 and is situated on just over two acres of finely manicured land. With an interior boasting soaring ceilings and open spaces, the Midwest abode features approximately 12,459 square feet of living space with five bedrooms, six full and three half bathrooms, foyer with floating spiral staircase to lower level, elevator, circular formal living room, formal dining room, butler's pantry, chef's kitchen with stainless appliances and breakfast bar, breakfast room, family room with fireplace, home office, lower level billiards room, recreation room with wet bar, home theater, and an exercise room. There are two three-car garages and a carriage house with bedroom, kitchen, and living area. Outdoor features include a gated porte-cochere, motor court, covered front porch, terrace with fireplace and BBQ kitchen, balcony, covered and open patios, and a free form swimming pool. This stone and stucco mansion in Sunapee, NH was built in 2014 and is situated on just over an acre of land overlooking the area's prominent lake. It features approximately 9,437 square feet of living space with six bedrooms, eight full and three half bathrooms, foyer with L-shaped staircase, formal living room with fireplace and exposed box beam ceiling, formal dining room, country-style gourmet kitchen with breakfast bar, family room with fireplace, screened-in porch with fireplace, a study loft, lower level recreation room with wet bar, billiards room, home office, an exercise room, garage parking for five (including detached three-car garage). The detached guest house (above garage) features an expansive living/kitchen/dining space and second floor bedroom and bathroom. Outdoor features include a motor court, front covered porch, balcony, patio, BBQ kitchen, fire pit, and dock. 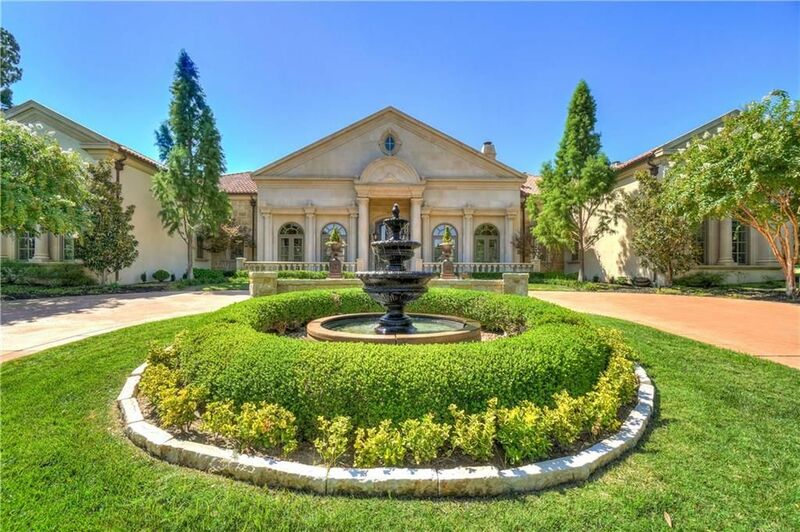 Built in 1987 on 1.53 acres of flat land, this French Traditional-style brick and stone mansion in Plano, TX is situated behind a gated entrance and features approximately 9,191 square feet of living space. It has six bedrooms, seven full and two half bathrooms, two-story foyer with floating staircase, formal living room with fireplace, formal dining room, two-story great room with fireplace and box ceiling, wet bar, sun room, gourmet kitchen with stainless steel appliances and breakfast bar, breakfast room, mahogany home office/library with fireplace, wine cellar, media/game room, exercise room, guest quarters (with bed, bath, living, and kitchenette), a four-car garage, and much more. Outdoor features include a auto gated entrance, porte-cochere, motor court, front covered porch, breezeway, terraces, covered and open patios, BBQ kitchen, swimming pool with water features, gazebo with two-sided fireplace, and a putting green. This U-shaped contemporary-style mansion located in Albuquerque, NM was built in 2004 and is situated on 1.48 acres of land and offers peerless views of surrounding mountain ranges. It features approximately 11,777 square feet of living space with seven bedrooms, eight full and one half bathrooms, open concept foyer/living/dining area, gourmet kitchen with double islands and barrel vault ceiling, breakfast room, family room with fireplace and wet bar, game room with wet bar, upper level recreation room with wet bar and fireplace, wine cellar, expansive home gym, and home theater. The interior guest house has a bedroom, living area, and kitchenette. There is also garage parking for seven cars and much more. Outdoor features includes two gated entrances, covered front porch, wraparound deck, terraces, covered and open patios, kitchen with Teppan grill, three-sided fireplace, swimming pool, spa, and putting green. Boasting dynamic city views, this contemporary-style mansion in West Vancouver, BC, Canada was built in 2017 and is situated on just under 1/4 of an acre of land. It features approximately 9,594 square feet of living space with six bedrooms, nine bathrooms, two-story foyer with floating staircase and partial barrel vault ceiling, elevator, formal living room with fireplace, formal dining room, gourmet kitchen with breakfast bar, breakfast room, family room with fireplace, home office, lower level family room, game room with kitchenette, and home theater, and a three-car garage. 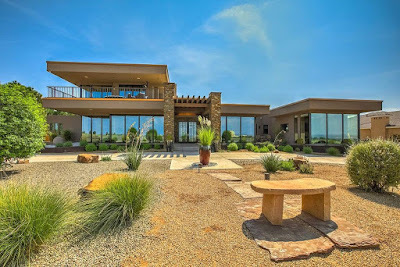 Outdoor features include a covered front porch, terraces, patios, fire pit, and an infinity-edge swimming pool with spa. This beautiful stone and stucco mansion in Glen Allen, VA was built in 2000 and is situated on 0.41 acres of land backing to one of The Dominion Club's fairways. It features approximately 8,458 square feet of living space with six bedrooms, eight bathrooms, two-story foyer with U-shaped staircase, sunken formal living room with fireplace, formal dining room, chef-inspired kitchen with large center island, breakfast room, family room with fireplace and media center, home office, craft room with vaulted ceiling, game room, study room, lower level recreation room with music studio, and a three-car garage. Outdoor features include a front covered porch, balcony, patios, pergola, and a swimming pool. 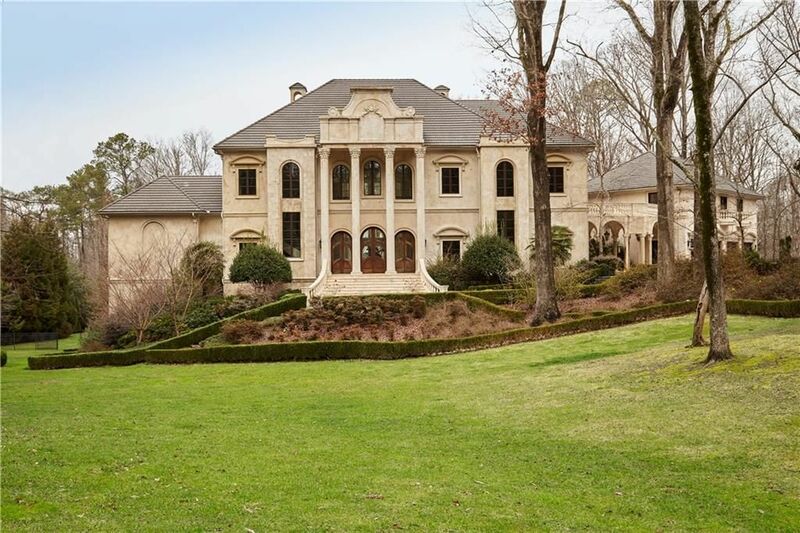 This European-inspired mega mansion in Atlanta, GA was built in 2006 and is situated on just under six acres of land. 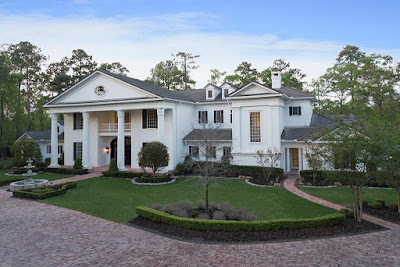 It features approximately 22,500 square feet of living space, with five bedrooms, seven full and four half bathrooms, two-story foyer with floating staircase, elevator, two-story great room, formal dining room, gourmet kitchen with double islands and stainless steel appliances, breakfast room, family room with fireplace and media center, home office, and a four-car garage. The walkout lower level includes a wine cellar, wet bar, game room, and a home gym. 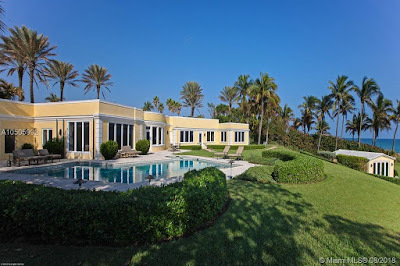 Outdoor features include a gated entrance, motor court with fountain, front portico, breezeway, balconies, upper and lower terraces, fireplace, patio, infinity-edge swimming pool with water feature, a fire pit, and formal gardens. 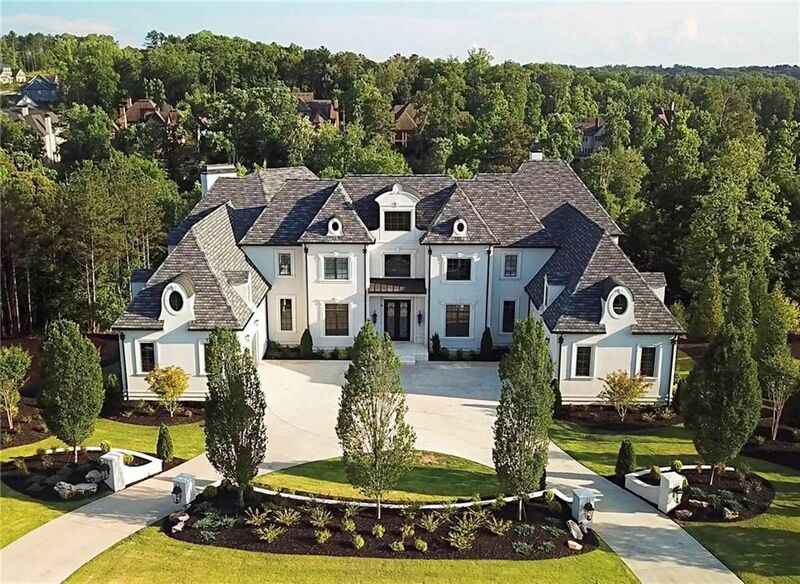 This European-inspired golf course mansion in Alpharetta, GA was built in 2017 and is situated on 1.75 acres of land. The stucco and stone home features 15,000+ square feet of living space with seven bedrooms, seven full and three half bathrooms, a two-story foyer, two staircases, an elevator, formal living and dining rooms, gourmet kitchen with stainless steel appliances and breakfast bar, breakfast room, wet bar, family room with fireplace and inset barrel vault ceiling, home office, upper level media room, 600-bottle glass-enclosed wine room, expansive lower level recreation room with wet bar, home gym, indoor sport court, steam shower and sauna, and two two-car garages. Outdoor features include a motor court, deck with fire pit, covered and open patios, free form swimming pool with spa, 11-seat swim-up bar, and a BBQ kitchen. Sporting Mediterranean flair from the inside out, this stone and stucco mansion in Boise, ID was built in 2007 and is situated on 3.37 acres of land with views of downtown Boise. It features approximately 9,335 square feet of living space with five bedrooms, five full and one half bathrooms, great room with fireplace, formal dining room, gourmet kitchen with stainless steel appliances, breakfast room, rear staircase, a home office, home theater with stadium seating, recreation room, four-car garage, and much more. Outdoor features include a motor court, covered terrace, and a covered patio. 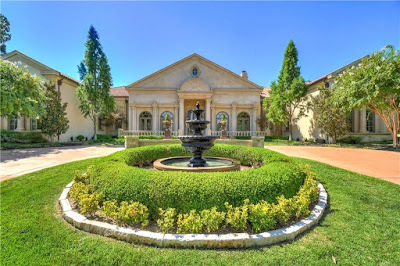 This stucco mansion in Dallas, TX was built in 2008 and is situated on an acre of land. It features approximately 12,629 square feet of living space with six bedrooms, seven full and two half bathrooms, two-story foyer with staircase and barrel vault ceiling, two-story great room with fireplace, formal dining room, chef-inspired eat-in kitchen with top-of-the-line appliances, family room with wet bar, home office, climate-controlled wine cellar, game room with wet bar, home theater, lounge with DJ booth, exercise room, and four-car garage. Outdoor features include a gated entrance, motor court, cabana with fireplace and BBQ kitchen, expansive open patio, and a swimming pool with water features. 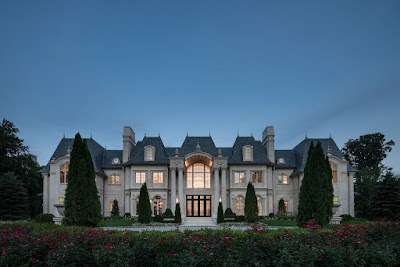 Built in 2017 and located in Alpine, NJ, this French-inspired limestone mega mansion dubbed "Chateau de la Roche" is situated on two acres of meticulously manicured land and boasts approximately 25,700 square feet of living space. The Zampolin and Associates-designed home features seven bedrooms, nine full and three half bathrooms, two-story foyer with double staircase, elevator, two-story great room with fireplace, formal dining room, gourmet kitchen with double islands and breakfast bar, breakfast room, family room with fireplace and built-in media center, paneled library with fireplace, two-story sun room, 1700-bottle wine cellar, recreation room with wet bar and fireplace, 15-seat home theater, and garage parking for four. Outdoor features include two gated entrances, motor court, expansive patio, terrace, loggia with BBQ kitchen and fireplace, swimming pool with spa, and pool house with cabana. 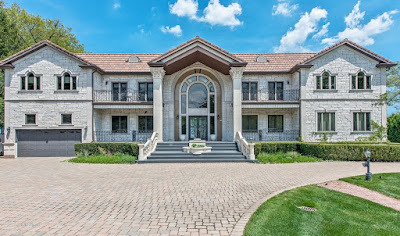 Located in Winnetka, IL and situated on a half acre of land on one of East Winnetka's prime roads, stands this Beaux Arts-style stone mansion that was built in 2010 and within walking distance to the shores Lake Michigan. It features approximately 9,772 square feet of living space with six bedrooms, six full and two half bathrooms, foyer with two-story floating staircase, elevator, formal living room with fireplace, formal dining room, gourmet kitchen with breakfast bar and butler's pantry, a combination breakfast and family room with center fireplace, billiards room with fireplace, a study room, lower level recreation room with fireplace and wet bar, a playroom, home theater, an expansive mudroom, and an underground three-car garage. Outdoor features include a balcony, Juliet balconies, rooftop terraces, and patios. 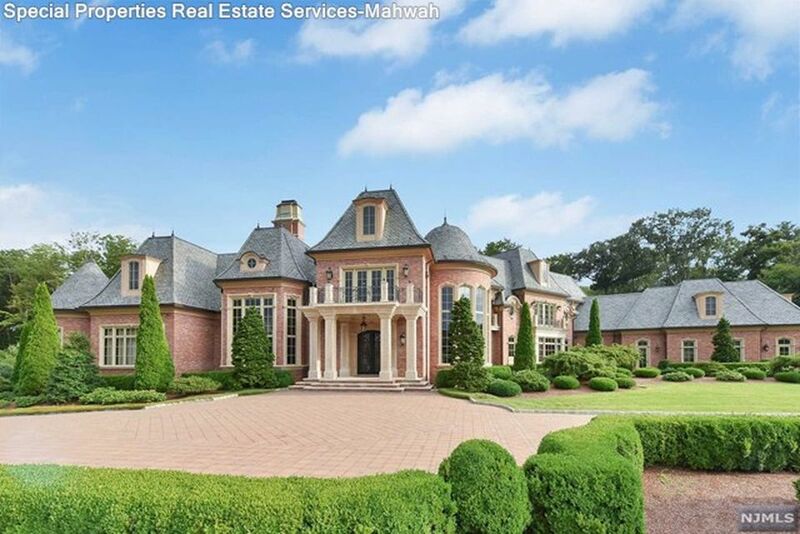 This Georgian-style brick and stone-accented mansion in Southborough, MA was built in 2002 and restored to pristine conditions in 2018 to the tune of nearly $1.8 million. The stately home is situated on five acres of land and features approximately 15,980 square feet of living space with six bedrooms, five full and three half bathrooms, foyer with staircase, formal living and dining rooms with fireplaces, expansive gourmet kitchen with double islands and fireplace, breakfast room, family room with fireplace and wet bar, paneled home office/library with fireplace, conservatory, billiards room with wet bar, home theater, 37-foot indoor swimming pool with three-story vaulted ceiling, a four-car garage, and much more. Outdoor features include a motor court, covered front porch, decks, terrace, and patios. 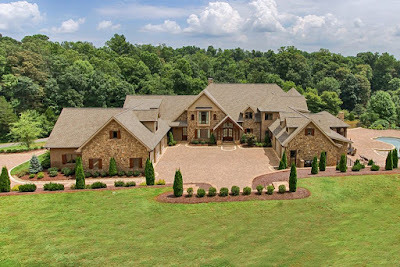 This stately brick and stone mansion in Knoxville, TN was built in 2015 and is situated on 15 private acres of land. It features approximately 13,071 square feet of living space with seven bedrooms, nine full and two half bathrooms, two-story foyer with staircase, elevator, two-story great room with stone fireplace, formal dining room, gourmet kitchen with breakfast bar, breakfast room, family room with stone fireplace, home office with vaulted ceiling, walkout lower level with second kitchen, recreation room, exercise room, and home theater. Other main floor features include a screened in porch with fireplace and garage parking for five cars. Outdoor features include a motor court, upper patio, free form swimming pool with spa and slide, a lower patio with fire pit, and a pond. 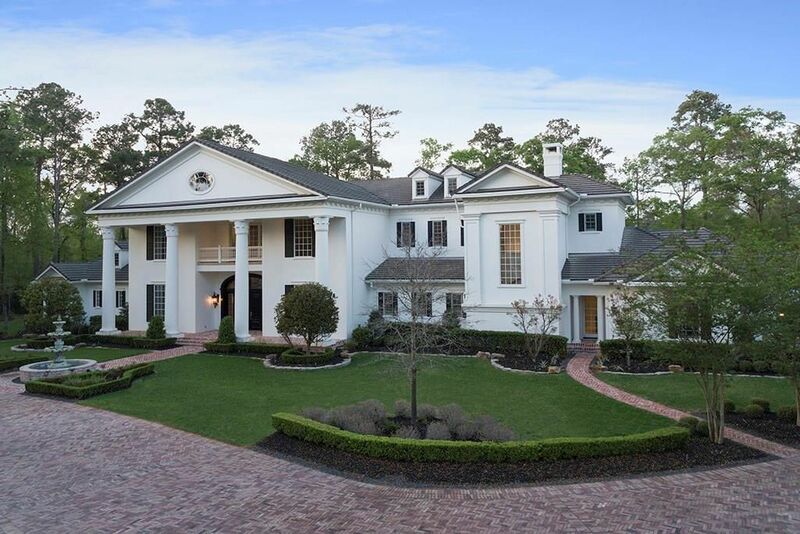 This traditional/modern mansion in Spring, TX was built in 2009 and is situated on just over three acres of land backing to the 16th hole of the Carlton Woods golf course. The beautiful home features approximately 9,585 square feet of living space with six bedrooms, six full and one half bathrooms, foyer with two-story floating staircase, elevator, open concept living and dining rooms with fireplace, country-inspired gourmet kitchen with double islands, family room with fireplace, two-story home office/library, game room, home theater, garage parking for four cars, and much more. 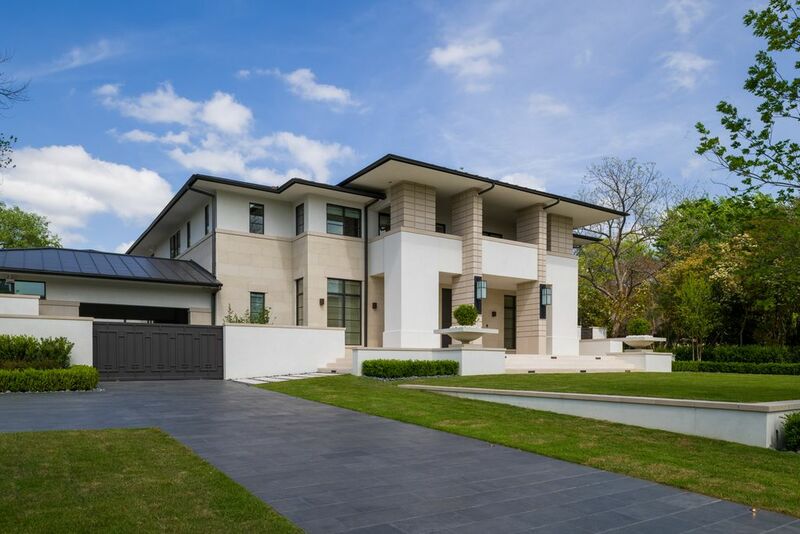 Outdoor features include two gated entrances, motor court, fountain, front portico and balcony, rear upper and lower terraces, BBQ kitchen, and a swimming pool with spa. 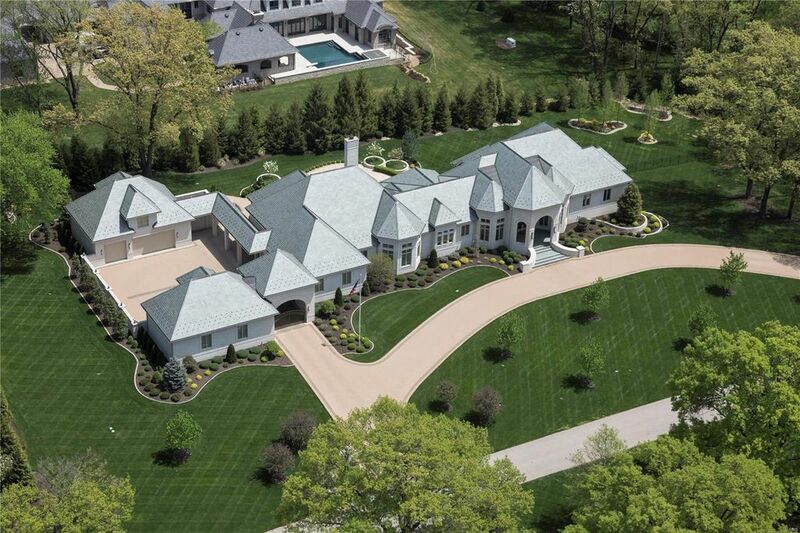 This mega mansion in Weldon Spring, MO was built 2006 by a tech CEO, sports car collector, and speedboat aficionado. The regal brick and stone home is situated on seven acres of land and features approximately 25,000 square feet of living space with five bedrooms, six full and two half bathrooms, two-story foyer with double staircase, commercial elevator, formal living and dining room, two butler's pantries, gourmet kitchen with double islands, breakfast room, family room, two home offices both with fireplaces, study room, reading loft, storage room, indoor basketball/racquetball court, home gym, sauna, garage parking for five cars plus an indoor commercial car wash bay, a lower level garage with 18-foot walls, a workshop, and more. There is also a third floor observation tower that offers river views. Outdoor features include a gated entrance, a gated porte-cochere, motor court, covered front porch, and rear terraces. 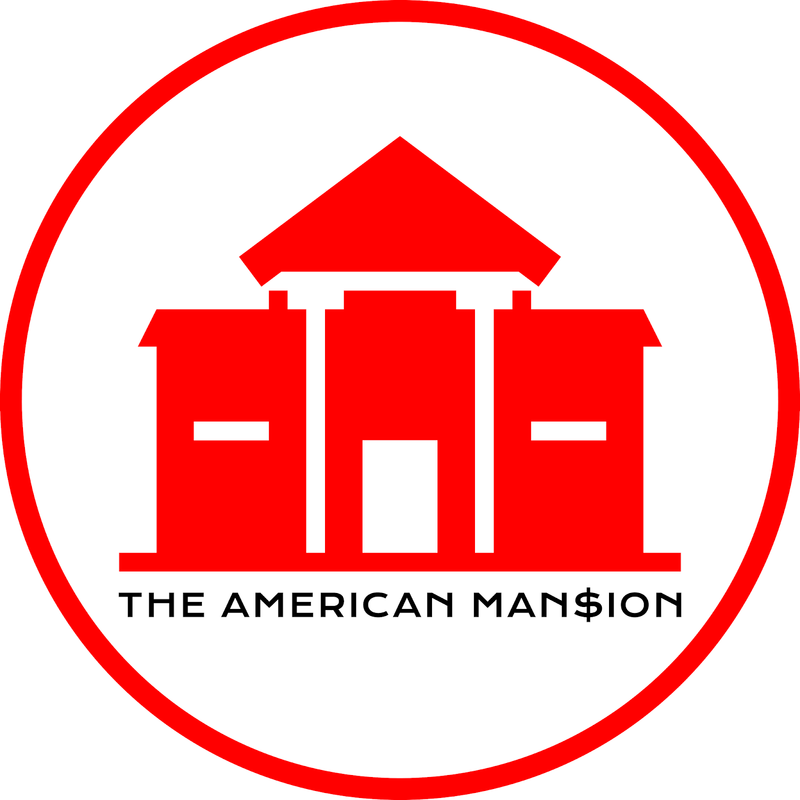 This stately limestone mansion was built in 2001 and is situated on just under two acres of land overlooking Lake Michigan. It features approximately 11,217 square feet of living space with seven bedrooms, eight full and two half bathrooms, two-story foyer with floating staircase, two-story great room/dining combination with fireplace, designer gourmet kitchen with stainless steel appliances, breakfast room, home office, media room, expansive play room with skylight, home gym, and a three-car garage. The lower level includes a family room, wet bar, wine cellar, home theater, game room, and more. Outdoor features include a motor court, covered front porch, balconies, rooftop terraces, patio, boat dock, and private beach. This waterfront French Normandy-inspired mansion in Barrington, RI was built in 2005 and is situated on 5.1 acres of land (including a 1.2 acre buildable lot) with peerless views of the Narragansett Bay. It features approximately 13,293 square feet of living space with seven bedrooms, nine full and two half bathrooms, two-story foyer with winding staircase, elevator, expansive formal living room with fireplace and wet bar, formal dining room, butler's pantry, rear staircase, gourmet kitchen with breakfast bar, breakfast room, family room with fireplace and media wall, third floor observation room, lower level with game/media room, wine cellar, home gym, and a professional putting green. The main level also includes a three-car garage. Outdoor features include a motor court, balcony, covered and open patios, and a tennis court. 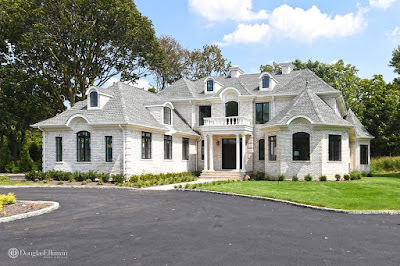 The newly built colonial-style mansion in Old Westbury, NY is situated on 2.4 acres of land on a private cul-de-sac and features four-sides of white brick. It has approximately 10,187 square feet of living space with six bedrooms (including two master bedrooms), four full and one half bathrooms, two-story foyer with L-shaped staircase, formal living and dining rooms, two-story great room with fireplace, gourmet kitchen with stainless steel appliances, breakfast room, bonus rooms, and a three-car garage. Outdoor features include motor court, covered front porch, and a rear patio. This freshly completed stucco and stone mansion in McLean, VA is located in the prestigious Langley Forest neighborhood on one acre of land. It features approximately 14,799 square feet of living space with six bedrooms, six full and three half bathrooms, two-story foyer with winding staircase, an elevator, formal living room with fireplace, two-story great room with fireplace, formal dining room, butler's pantry, gourmet kitchen with an array of stainless steel appliances, breakfast room, a catwalk overlooking great room, home office, and a four-car garage. The walkout lower level offers potential for recreation room, family room with fireplace, wet bar, home theater, and exercise room. Outdoor features include a motor court, balconies, expansive flagstone patio, BBQ kitchen, pergola with fireplace, and a fire pit. 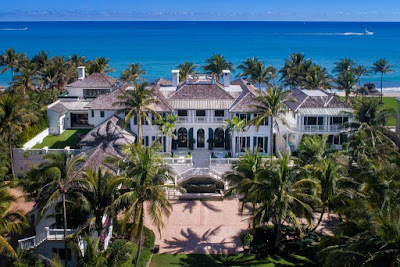 Boasting multiple breezy outdoor spaces that offer sweeping views of the ocean, this mega mansion in North Palm Beach, FL was inspired by the style of the British West Indies. Built in 2014 and situated on 1.4 acres of land, the home features approximately 23,176 square feet of living space with nine bedrooms, 11 full and four half bathrooms, foyer with a three-story staircase that features a cascading Swarovski crystal chandelier, an open concept living/dining room with fireplace, gourmet kitchen with double islands, breakfast room, family room with direct access to the alfresco dining area, a home office, and much more. The lower level features a temperature-controlled wine cellar, a catering kitchen, home theater, home gym, and four-car garage. 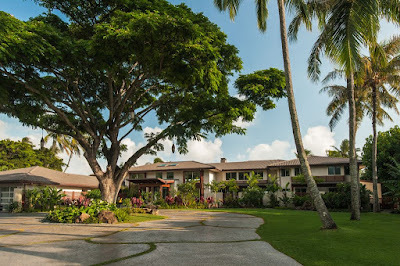 Outdoor features include a gated entrance, motor court, porte-cochere, balconies, terraces, rooftop terrace, two water features, swimming pool with spa, fire pits, half-court basketball court, putting green, cabana house, and a guest house with two, two-bedroom apartments. Nestled below the Ramapo Mountains on four acres of land is this stately brick and stone mansion that was built in 2009 by Labarbiera Custom Homes. The stately French-inspired home in Mahwah, NJ features approximately 18,000 square feet of living space with six bedrooms (including two master suites), six full and two half bathrooms, two-story foyer with Y-shaped floating staircase, two-story living room, two-story great room with fireplace and media center, paneled billiards room with fireplace, formal dining room, two-story gourmet kitchen with painted ceiling, breakfast room, an additional staircase, a loft, an expansive lower level, and a four-car garage. Outdoor features include a motor court, covered front porch, terraces, patios, and a swimming pool with spa. This newly built brick mansion is situated a landscaped 2/3 acre lot in Glencoe, IL. 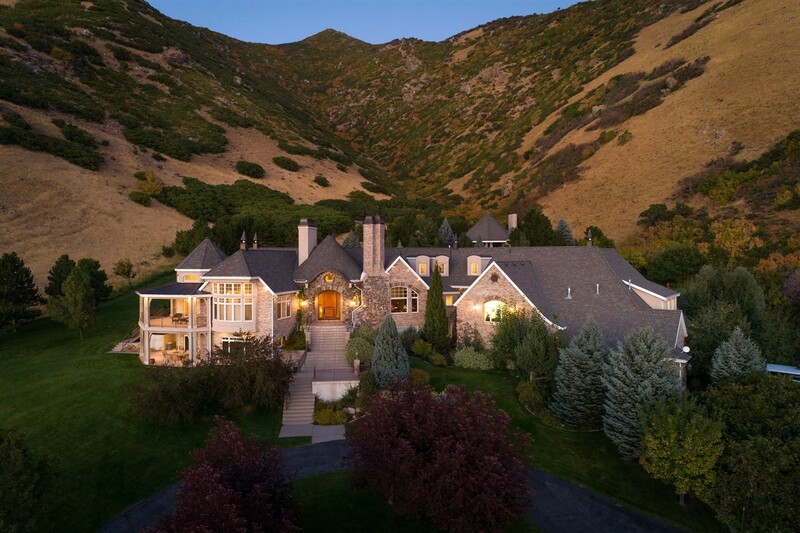 It features approximately 9,417 square feet of living space with five bedrooms, five full and three half bathrooms, two-story foyer with winding staircase, formal living and dining rooms, chef-inspired gourmet kitchen with stainless steel appliances, butler's pantry, breakfast room, family room with fireplace, home office, and a three-car garage. The walkout lower level features an expansive recreation room, glass-enclosed wine room, wet bar, home theater, and exercise room. Outdoor features include covered front porch, rear deck, and patio. This freshly completed Frank Lloyd Wright-inspired mansion in Dallas, TX is constructed of concrete, metal, and stone giving it an incredibly polished look from the inside out. It features approximately 12,266 square feet of living space with four bedrooms, four full and five half bathrooms, two-story foyer with a Jenga-like floating staircase and floor-to-ceiling windows, formal living room with fireplace, formal dining room, sleek gourmet kitchen with double islands, breakfast area, family room, expansive second floor recreation room with wet bar and terrace access, beautiful glass-enclosed wine cellar, nine-seat home theater, garage parking for three cars, and much more. Outdoor features include a gated porte-cochere, covered front porch, multiple terraces, cabana, BBQ kitchen, and a swimming pool with spa. 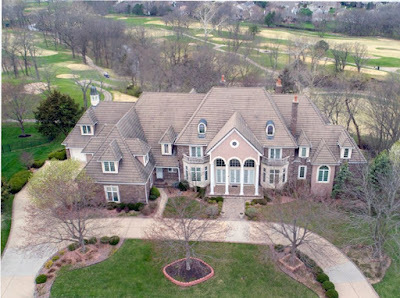 This stately brick and stucco mansion in Leawood, KS was built in 1991 and is situated on just under an acre of land overlooking Deer Creek Golf Club's 9th fairway. It features approximately 11,530 square feet of living space with five bedrooms, six full and three half bathrooms, two-story foyer with floating winding staircase, two-story great room with box ceiling and fireplace, formal dining room, gourmet kitchen with large center island, breakfast room, family room, home office/library with fireplace, a loft, lower level recreation room with second kitchen, billiards room, exercise room, and garage parking for eight vehicles. Outdoor features include a front portico, open and covered terraces, and a patio. 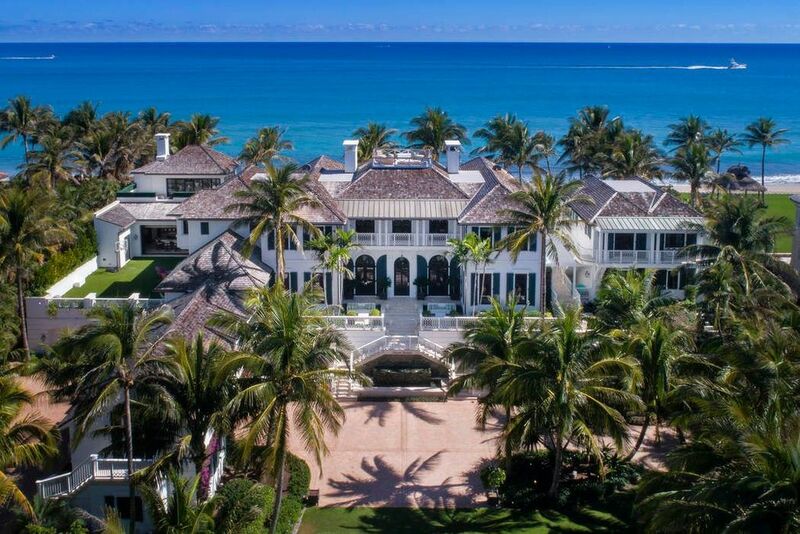 Built in 1989 and situated on 1.43 acres of land in Honolulu, HI, this Balinese-inspired mansion boasts 185 linear feet of beach frontage and offers an incredible marriage of indoor/outdoor living spaces. It features approximately 13,880 square feet of living space with seven bedrooms, eight full and one half bathrooms, a two-story foyer with floating spiral staircase, an expansive two-story great room with fireplace, formal dining room, gourmet kitchen with 14' island/breakfast bar, family room, a maid's/guest quarters, a three-car garage, and much more. Outdoor features include a gated entrance, motor court, covered front entry with water features and fire bowls, balcony, lanais, rock garden, infinity-edge swimming pool with spa, pool house, and a tennis/sport court. 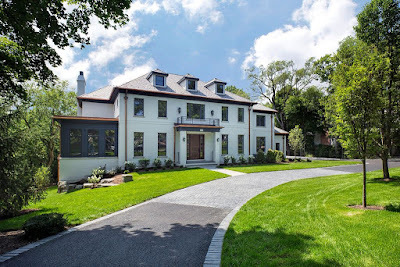 Based in South Norwalk, CT, Cordello Architects was founded by Robert A. Cardello, a graduate of Tulane University. For over 21 years, Cardello has had a hand in designing some of the New England region's finest commercial and residential properties. David A. LaPierre joined Cardello Architects in 2004 and has been a key player in the success of the firm and its numerous awards. See some of RAC's beautiful homes below. This newly built shingle and stone Craftsman-style mansion in Rockville, MD is situated on just under an acre of land and features 8,400+ square feet of living space over three levels. The home has six bedrooms, six full and two half bathrooms, two-story foyer with staircase, elevator, formal living and dining rooms, two-story great room, rear staircase, gourmet kitchen with stainless appliances, breakfast room, a separate prep kitchen, recreation room with wet bar, family room, home theater, three-car garage, and more. Outdoor features include a covered front porch and a rear patio. 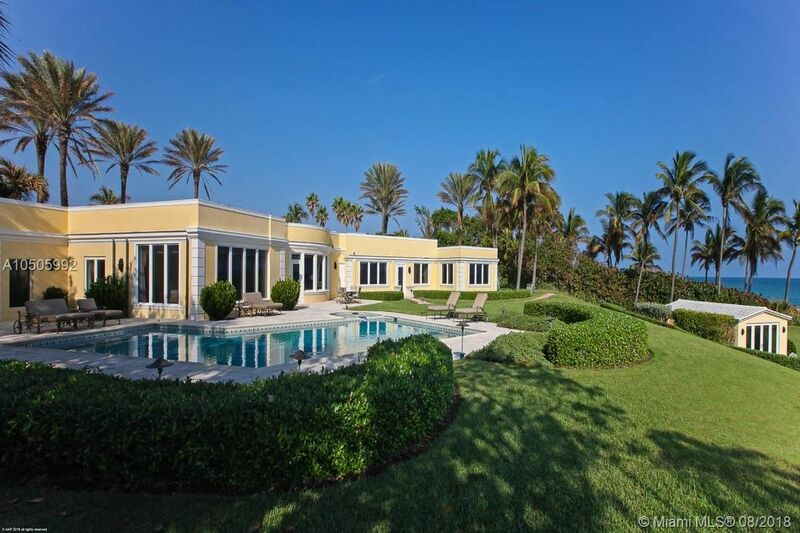 Built in 1998 and situated on 2.46 acres of land, this Neoclassical-style mansion located on Jupiter Island in Hobe Sound, FL sits directly on 221' of beach frontage with unobstructed views of the ocean. 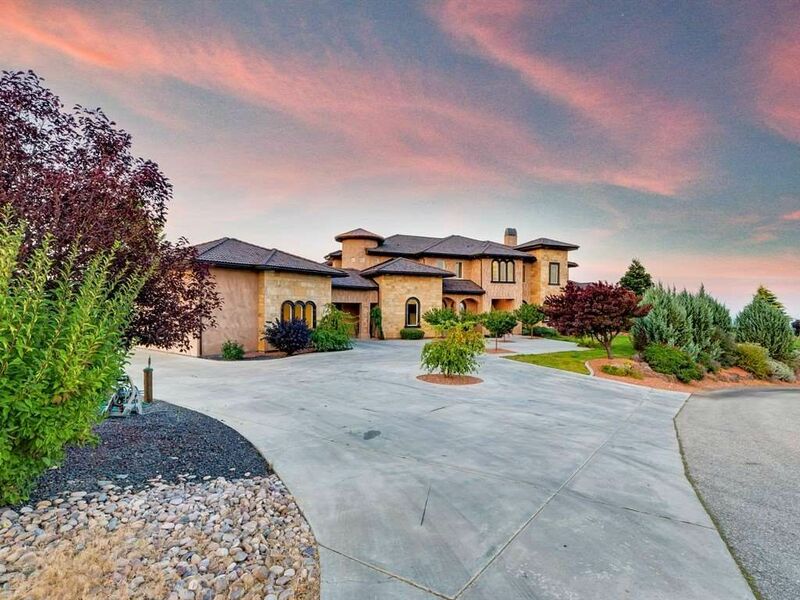 It features approximately 9,938 square feet of living space with seven bedrooms, seven full and two half bathrooms, foyer with staircase, formal living and dining rooms, great room, gourmet kitchen with stainless steel appliances, breakfast room, library/study, billiards room, a four-car garage, and more. Outdoor features include a motor court, terraces, swimming pool, and tennis court.